Commanding a prominent position on the coast of Costa Brava, Roca Grossa is a leading LuxCamp that boasts facilities and activities for all ages. 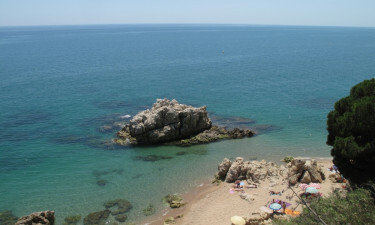 This part of Spain is famous for its beautiful beaches and a stretch of sand can be found on the edge of the site. The enchanting coastal town of Sant Pol de Mar is located less than a mile from Roca Grossa, while Barcelona is around 30 miles away. The whole family can also have fun together on the site by taking part in a range of different sports, such as tennis, football and basketball. 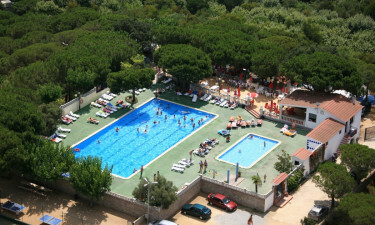 Why choose Camping Roca Grossa? 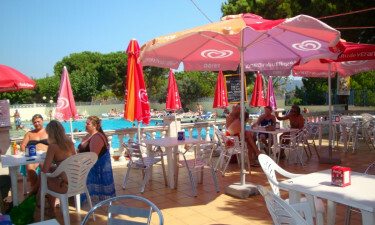 There are two onsite swimming pools for guests to make use of during their luxury camping break. Activities such as diving lessons are regularly organised in the main pool, while colourful floats are available for the kids to use while they splash around and keep cool in the smaller pool. It takes just a couple of minutes for guests to stroll from their mobile home to the Calella, which can be found on the edge of the site. The beach boasts dramatic rocky outcrops that families are sure to enjoy exploring, in between spreading out on the sand.